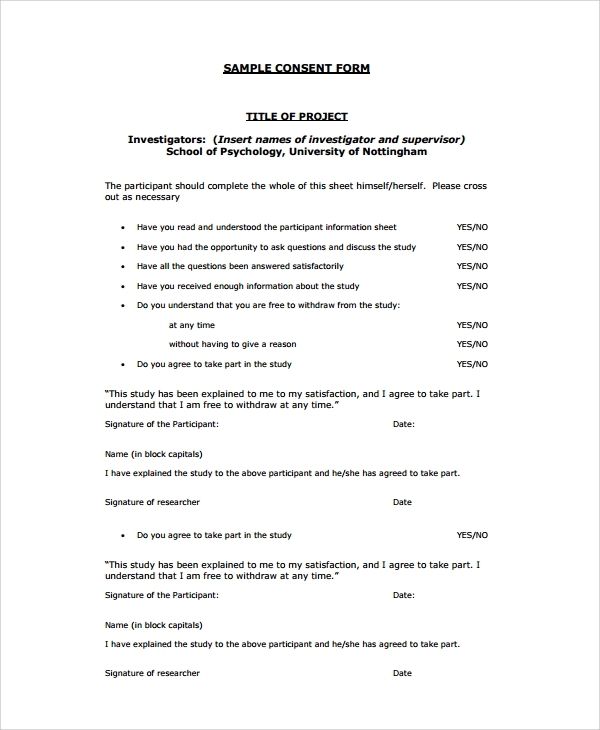 Psychologists may consider a patient having a unique psychological disease as ‘subject’ for their studies or research. The process will try helping the patient to recover, and at the same time patient would be used for further experiments. Experiments may go wrong, and thus patient’s family members need to understand the risk. 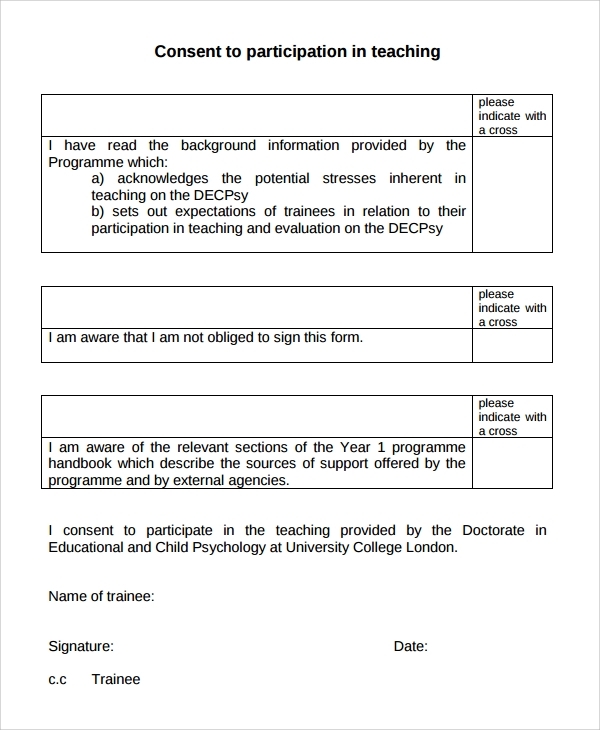 This is why consent form for research has to be obtained. Many patients are used for psychological experiments by the psychologists. The process ensures treatment for patients, along with some groundbreaking medical techniques that may go completely wrong. Thus, consent needs to be achieved from the patient or his family before performing such experiments. To obtain consent, a perfectly articulated consent form has to be sufficed to patient party. Many kids suffer from complex and unique psychological disorders. For them, special psychological healing techniques are required to be adopted. Now, the healing process may have some risks. So, consent from child’s parents has to be obtained before carrying out such treatment measure. 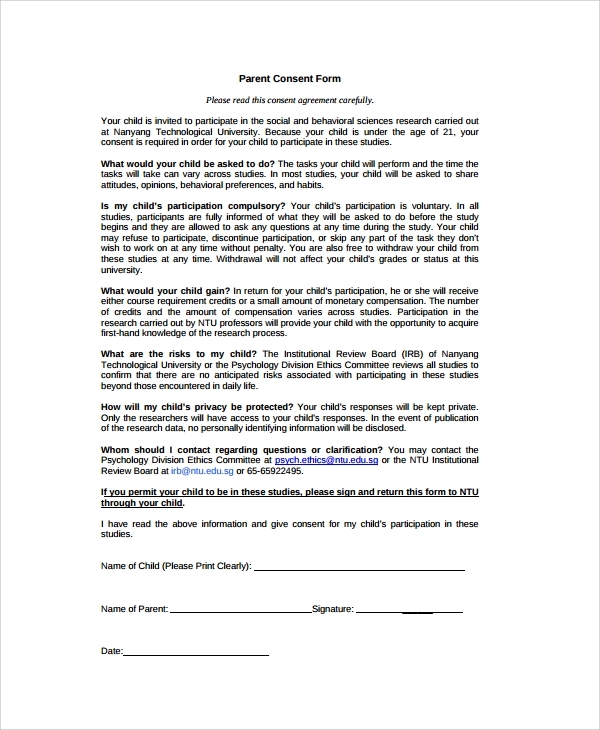 Download and use Child Medical Consent Form template for this purpose. In many cases, a lot of sportsmen are noted to undergo psychological disorders. There is no fixed technique for the treatment of any psychological disorder, as for different people the treatment approach could be different. The process of healing may involve a few risks. Thus, consent needs to be obtained from the patient before providing treatment services. 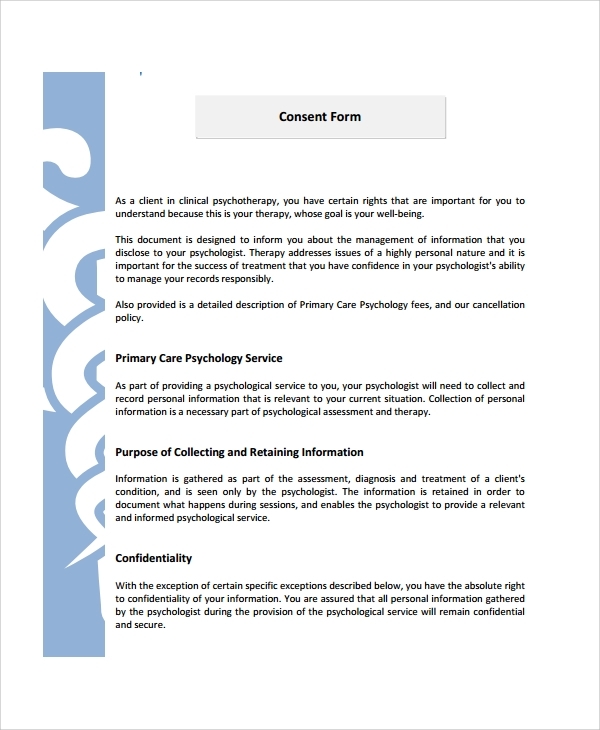 A psychological consent form is considered as an important medical documentation and a formality that needs to be carried out with precision. Psychological treatment may involve a lot of things. A few drugs are required to be given to the patient and at the same time, mental counseling process needs to be carried. The overall process of psychological treatment is vast as well as extensive. It may have some side effects. The process may not be successful, and can make patient’s condition more critical. This is why consent from the patient or his family member is required in proper documentation format. This documented format is known as a consent form. Informed consent should include the overview about the disease, requirement medical treatments, uses of drugs, counseling methods and more. 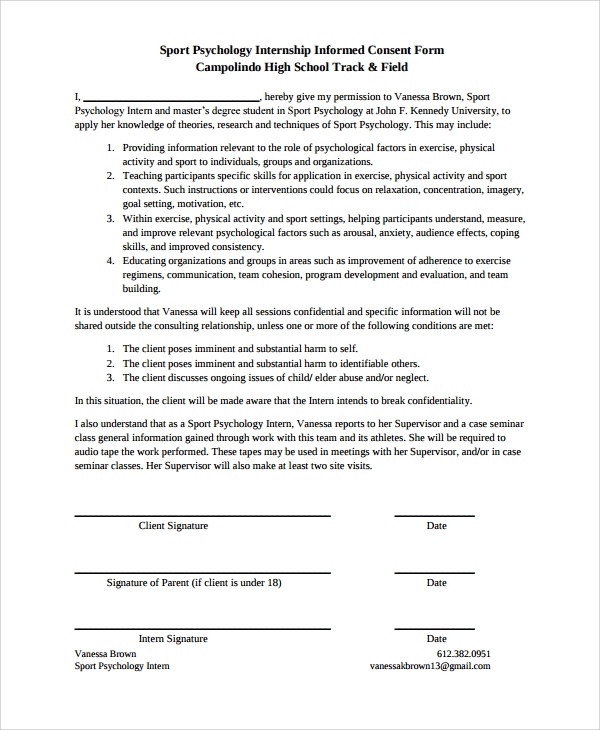 Creating a psychological consent form is not easy, as it should be well structured, containing all information with perfection. 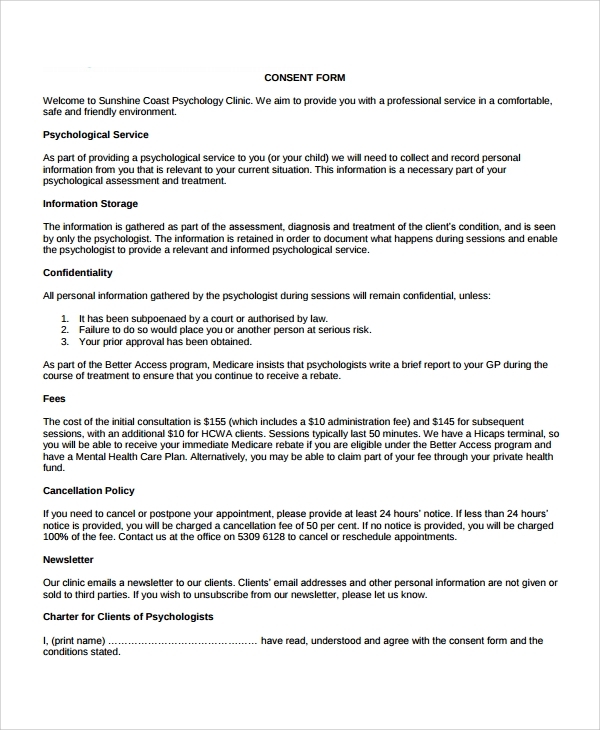 The best way of getting psychological consent form is by downloading template from the web. Different kinds of templates are available at our website. 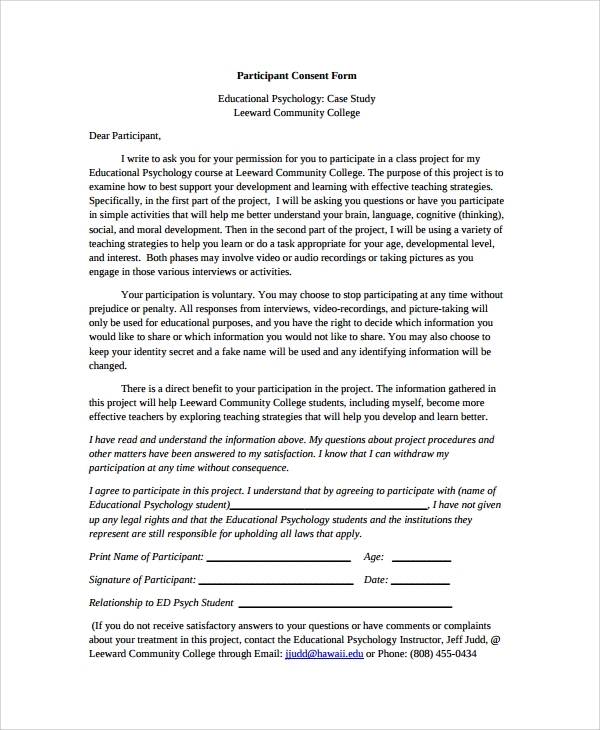 Choose the suitable one, and print it to create a perfect consent form.